The London Daily Mail has an interesting article today about a mysterious white cat that hops on the #331 bus several times a week and gets off at the same stop each time. According to the article, the unusually intelligent feline appears to be commuting to a nearby fish and chips shop. 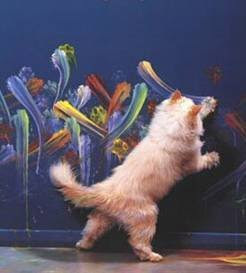 that cat in the pic is in a book called cats paint. Fish and chips.. wonder if owner works there?